The Autumn Cherry tree is an attractive fast growing blooming cherry tree. It is also known as the autumn flowering higan cherry tree. The tree, when established, produces attractive pink buds and white blossoms off and on during warm seasons in autumn and completely flowering in springs. The Autumn Cherry tree is a unique tree which has its blossoms appearing in the fall, when the rest of the trees are losing their leaves, and during the warm winter periods when trees are usually dormant. The flowering tree has semi double blooms with ten petal flowers which go through several color changes. These colors usually range from deep pink which appears during the bud formation, light pink, when the buds have slightly opened to almost white when it is fully open. The tree also has leaves that turn yellow, bronze, deep red or gold. The Autumn Cherry tree is a delicate, a rough but plain, sight at best with upright branching which is wide and spreading. In most cases, the branching can be as wide as the height of the tree. This tree is considered to be a hardy tree with hardy zones of five to eight. The tree is known to have several unique qualities which make it spectacular for landscaping. It stands out when planted in the yard as it adds color to yards in its fall season. In addition, it also has the potential for two flowering seasons. 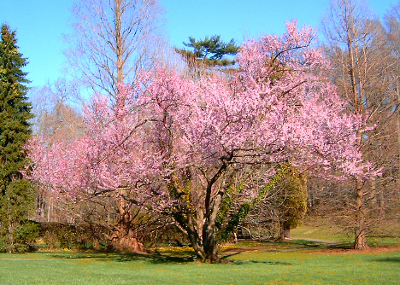 The flowering cherry tree has been known to establish well in the Tidal Basin of Washington DC.